You are here: Home / Blogging FAQ / What is Jetpack? Jetpack is a group of plugins under one master plugin. It is developed and produced by Automattic, the company that runs WordPress.com and the biggest contributor to the WordPress.org project. The purpose of Jetpack is to give you the best features from WordPress.com to use in your self-hosted (WordPress.org) blog. I’ve mentioned before that you should have your own blog, on your own domain and hosted by an independent host. Jetpack gives you the best of both worlds.Access to easy to use and configure features from WordPress.com but hosted on your own blog. 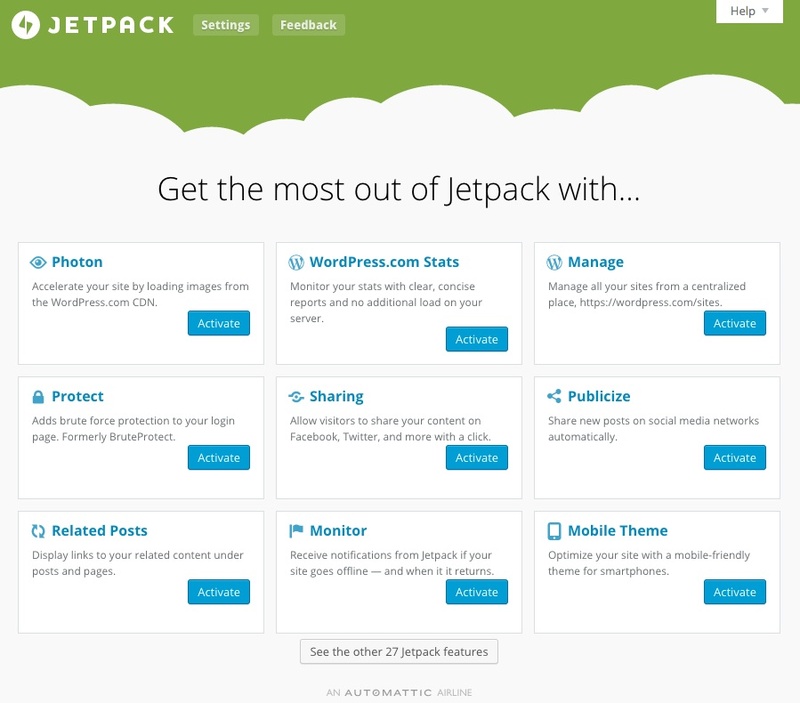 Jetpack is a collection of these features in the form of plugins. Most of them are free, but a few require payment for over usage or for premium features. All of the Jetpack features are managed through one main interface instead of individual plugins. WordPress.com Stats keeps track of basic traffic analytic reports on your blog. Photon, helps you speed up your website by giving you a CDN for your blog. Widget Visibility allows you to customize which widgets to show on specific pages or categories allowing you to customize your user experience. Mobile Theme helps you make your blog mobile-friendly without having to change your theme. Related Posts is a cool feature that scans through your blogposts and gives you the option of sharing posts about the same topics after your main content. To install Jetpack, go to your Plugins dashboard, click on add new and search for Jetpack. Install it like any other plugin then activate it. Once you activate it you’ll see access to Jetpack settings under the main Dashboard menu in your WordPress dashboard. Very cool Bridget. I like the mobile app for WP but I prefer the regular mobile version of the dashboard, I think it works better. Sometimes the app doesn’t work as intended.